Last year was the first time David Green, CEO of a sports compression company 110% Play Harder, had run the Boston Marathon. The Ironman and ultra-endurance athlete had just crossed the finish line and was walking to meet some friends when the first bomb went off, then the second. He took a picture. It just so happened to be the first sighting of bombing Suspect No. 2, Dzhokhar Tsarnaev. The left side of Green's photo would go viral, leading to a nationwide manhunt and eventual capture of the Tsarnaev brothers. A year later, Green is back in Boston. These are his words and photos. "I finished the race about 1:50 p.m., dipped into a store to charge my phone, and walked out a minute before the bomb went off. It sounded like a cannon salute. And then the second bomb went off probably 40 or 50 yards ahead of me. There was a sensory explosion, between the sounds and the smell. Just the fear. "I was in New York during 9/11, and I think there are singular moments that are angles of repose of world-changing events. Maybe it was that experience that I had, that at that moment, time slowed down for me and I knew that something gravely bad was happening. So I pulled out my camera and took a picture. I can't tell you what I thought I was trying to capture. I don't know. I thought, I just need to take a picture of this." Later that night, Green submitted his photo to the FBI. He was thanked, and that was it. He posted the photo to Facebook to let friends and family know he was OK. That Thursday, the FBI released grainy surveillance footage of the two suspected bombers, one of whom was wearing a white baseball cap. "My friend called me and said, 'Dave, look at the photo you posted on Facebook. I could swear there's a kid in there with a white baseball cap.' 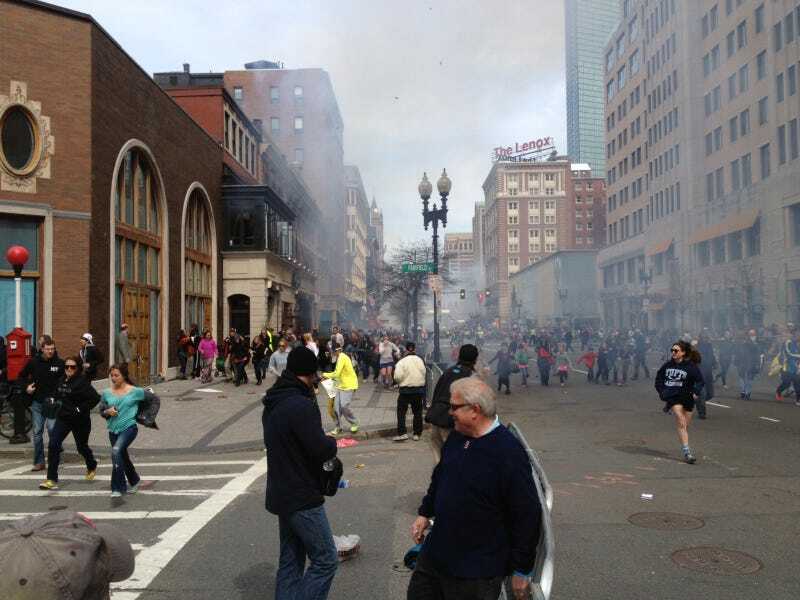 And the second I looked at that photo, you can see the number on his cap, you can see he's walking away with no backpack." Green called the FBI again, and he emailed the photo again at their request. They confirmed that the man in the white cap was a suspect, and that it was Green's "Constitutional Right" to distribute the photo and get as many eyes on it as possible. So he posted it to Facebook again. "Catching a moment in time, the horrible, historical incident, and seeing through that lens not only the crime and the atrocity, but the villain? Could you imagine catching Hitler in his bunker taking cyanide with people dying behind him? It's a crazy thought. "It's in that moment that you catch the fear, but it also caught the villain." On Monday, starting around 4:30 a.m., Green will run from the finish of the Boston Marathon out to the start, then turn around and run back, the start and finish of his story.